Deep sleep power consumption - has something been changed in the latest ESP_IDF release? Re: Deep sleep power consumption - has something been changed in the latest ESP_IDF release? I am looking at the 9mA mesurement but don't see the connected ESP32? only some kind of resistor? Missing some thing? What voltage are the (same?) batteries? Last edited by pcbreflux on Mon Feb 13, 2017 9:11 pm, edited 1 time in total. Blue NOA board is disconnected on the picture with 9uA measurement. ESP32 is just not fully visible on the photo, because it's a side view - ESP32 mounted on a small PCB with battery handlers and powered by 3.2v LiFePO4. I can confirm the 35uA current consumption in deep sleep mode in the latest ESP-IDF (that's the ESP32, flash chip, and pullup resistors current combined). This may be caused by a regression in RTC clock setup code, we're investigating. 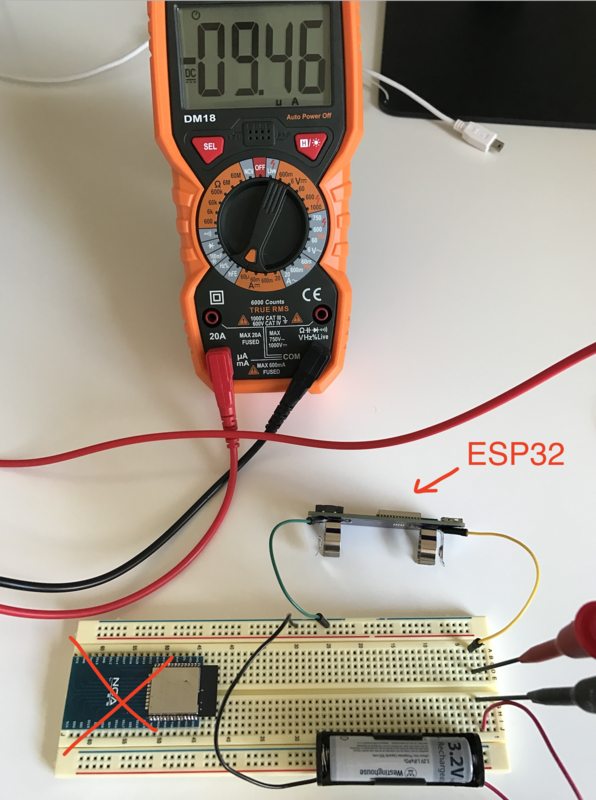 ESP_igrr wrote: I can confirm the 35uA current consumption in deep sleep mode in the latest ESP-IDF (that's the ESP32, flash chip, and pullup resistors current combined). This may be caused by a regression in RTC clock setup code, we're investigating. When librtc going to be open sourced? Turned out to be unrelated to RTC clocks. We'll have this change in master soon. With this change, supply current is back to 5.5 uA in my test. Current value is the total of all supply rails. Flash is powered from internal regulator. Hey, better than before, right? 9.46uA -> 5.1uA? Nice. I got the same problem with the current consumption in deep sleep. Can you make the Firmware available again (Link is not working)? Or should it work with the current status of firmware?